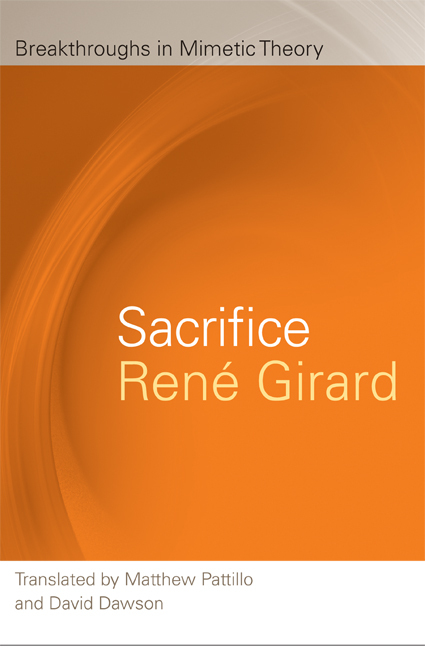 In Sacrifice, René Girard interrogates the Brahmanas of Vedic India, exploring coincidences with mimetic theory that are too numerous and striking to be accidental. Even that which appears to be dissimilar fails to contradict mimetic theory, but instead corresponds to the minimum of illusion without which sacrifice becomes impossible. The Bible reveals collective violence, similar to that which generates sacrifice everywhere, but instead of making victims guilty, the Bible and the Gospels reveal the persecutors of a single victim. Instead of elaborating myths, they tell the truth absolutely contrary to the archaic sense. Once exposed, the single victim mechanism can no longer function as the model for would-be sacrificers. Recognizing that the Vedic tradition also converges on a revelation that discredits sacrifice, mimetic theory locates within sacrifice itself a paradoxical power of quiet reflection that leads, in the long run, to the eclipse of this institution which is violent but nevertheless fundamental to the development of human culture. Far from unduly privileging the Western tradition and awarding it a monopoly on the knowledge and repudiation of blood sacrifice, mimetic analysis recognizes comparable, but never truly identical, traits in the Vedic tradition.